It’s 9:00 on a Monday morning in the middle of February. I’m tired. Kinda cranky. I’ve just come home to Washington, DC from a two-and-a-half-week vacation in Thailand. It was such a great vacation! The culture, the beaches, the food … and now it’s my first day back at work, in my home office. The weather stinks. It’s cold and drizzling. The jet lag stinks. Every cell in my body crying for sleep. Instead I’m gearing up to lead an executive offsite with my colleague, Carolyn, starting tomorrow. And what I’ve learned just-this-minute about the project stinks, because I’ve called Carolyn to say, “I’m back! How can I help?” and she tells me I don’t need to be there tomorrow after all because, well, basically, I’m no longer on the project. This news doesn’t improve my mood. OK, well, maybe all those “No! Don’t go!” client emails will be coming soon. I hang up the phone, and I’m trying to decide what to do with myself next: laugh, cry, or simply go back to bed, when the phone rings. It’s Carolyn. Time out for a quick poll—don’t think too hard about your answer. Can someone who lies be trusted? Your three choices are: no, yes, or maybe. Except my experience of Carolyn is exactly the opposite. In this moment, I trust her more than ever. How can that make any sense? Credibility is built not only by know-how, but also by honesty. Carolyn showed me she was willing to tell the truth about her un-truth. That’s not a mixed message; that’s a courageous act in the face of a human error. Intimacy gets created when we take risks, and when we make ourselves relatable. 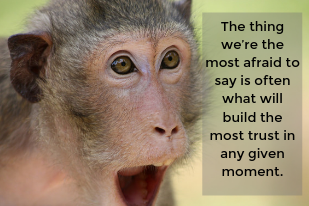 The thing we’re the most afraid to say is often what will build the most trust in any given moment. Carolyn’s admission was a risk, for sure—I might have slammed down the phone and refused to work with her again, who knows. Instead, I appreciated her bravery. Plus, I could totally relate to her quandary and her goof, because I myself have been caught off-guard and said things un-truths or partial truths. Haven’t you? Low self-orientation is proven when we demonstrate how much we care. Carolyn’s confession told me she valued our relationship more than she valued protecting herself, or saving face in the ways we humans are usually compelled to. So, can someone who lies be trusted? Maybe. If they’re like Carolyn, then absolutely. This week, look for stories from your own life, or your own experience of others in general, that illustrate the power of truth-telling. What do you see? 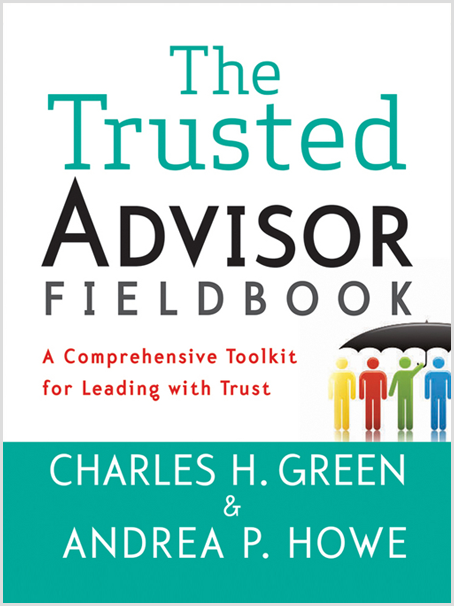 Find out what to do if you suspect your clients are lying to you, thanks to our friends at Trusted Advisor Associates, or brush up on how to use the trust equation to accelerate trust in Chapter 21 of The Trusted Advisor Fieldbook.